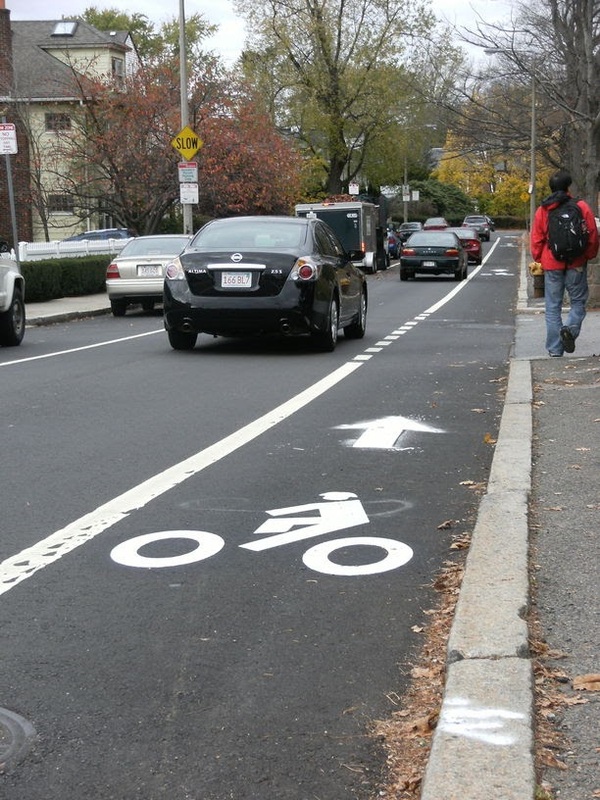 City workers were seen painting bike lane -- and shared bike lane -- markings on Brighton's Lake Street last Saturday morning. The stripes were painted from the beginning of Lake Street at Commonwealth Avenue down to the bottom of the steep hill at Lake Shore Road, approximately a half mile. The striped pavement looks to be approximately: 0.1 mile of exclusive bike lane; 0.25 mile of shared bike line on the right hand side of the street; and 0.15 mile of exclusive bike lane. The street was recently re-paved, which meant that a number of potholes larger than a newborn baby were filled in. Several dangerously protruding manhole covers are also now level with the asphalt, although one bad one still remains at a location halfway down the hill. For those who know the one-way street: it is fairly steep downhill such that a cyclist can easily speed over 40 mph unless braking steadily the whole way. In the past, I have had to ride in the center of the lane, blocking vehicular traffic -- weaving left-and-right because of the horrendous condition of the road surface. The resurfacing and bike lane are welcome improvements.